Have your mind prepared for new insights. 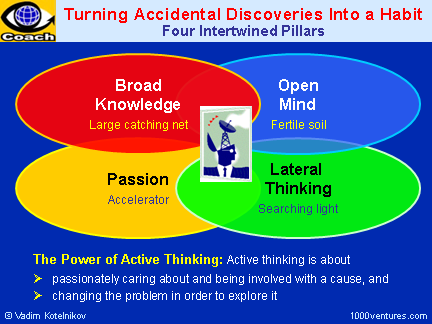 Expect to make an accidental discovery any moment. Many ideas surface in the strangest ways, often when they are least expected. Sometimes they seem to pop up almost by accident. 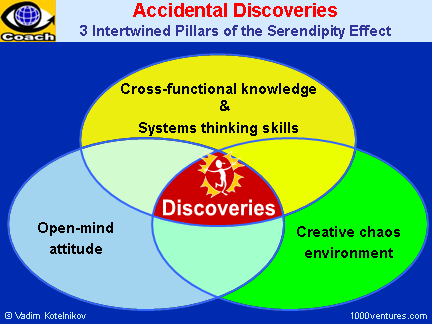 The accidental discovery is triggered by chaos and contradictions, rather than by order and logic. When open-minded people read, listen or watch, they often find things that catch their eye, leading them off into other areas of enquiry. The broader your net is, the more fish you catch. If you build broad cross-functional expertise, no idea will be wasted! Your mind can accept only those ideas that have a frame of reference with your existing knowledge and comprehension. It rejects everything else. If your → knowledge is functionally focused, you'll be open to new ideas related to your functional expertise only and will miss all other → learning and → innovation opportunities.